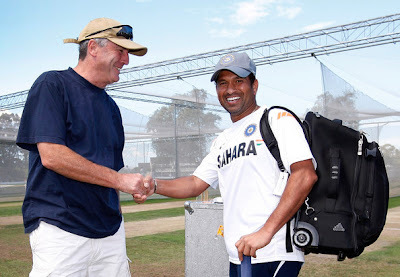 Former India coach John Wright had said Tendulkar is in the same league with Don Bradman and he has it in him to become the first cricketer to hit 100 international centuries. Also said he expects Tendulkar to continue at least till the 2011 World Cup and retire only when he desires to depending upon his body condition. John wright quoted he has the potential to possibly get a 100 international hundreds combining Tests and One dayers," said Wright, who had a successful five-year stint with the Indian team. Wright said going by form -- the master blaster hit a sublime 163 off 133 balls before retiring hurt in the third India-New Zealand ODI at Christchurch -- he expects the Indian to continue tormenting the bowlers. Sachin is the GOD of cricket. Rajdeep Sardesai recently said that whenever he felt depressed he would watch an old video od Tendulkar's batting and it would bring a smile to his face. Its true for most of us. He is the ultimate cricketer. Hope he stays fit and plays for many more years. Charu what you said is true ..
Sachin is the real cricket star. I doubt if india would again get a legend like sachin.